"Orange winey with a hint of roasted truffles, bright acidity, strong body with a soft sweet lychee finish"
If you’re a coffee lover who wants a fresh brew every time, you will enjoy the exclusive taste of Kopi Luwak Gold Label, now made simpler via Nespresso-compatible capsules. Yes, this new packaging allows you to savor the unique and naturally flavored coffee beans from Southwest Sumatra, Indonesia from single-serve brewers. Each Gold Label Nespresso-compatible capsule provides you a fresh new cup of luxuriously flavored coffee, exclusively your own. By using the features of the innovative coffee machine you will relish the very delicate and smooth flavor of selected coffee beans, as fresh as they were taken and processed from the Bengkulu plantations. Real coffee lovers want to savor the aroma and subtle flavors of their favorite drink, but not everyone has the time to prepare a fresh brew every time they need it. But now you don’t have to go to an expensive coffee shop or prepare anything from scratch when you have so little time to relish the perfect pour-over. We have just created the easy solution for you and packaged our high-class 100% authentic wild roasted Arabica Kopi Luwak beans into capsules, which you can use with any Nespresso machine. 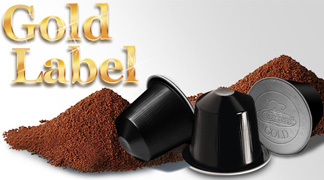 Gold Label – Nespresso-Compatible capsules are available in resealable packs of 12 capsules. They contain the same Arabica Kopi Luwak beans from Bengkulu, but are more finely ground and better tasting than ever! Be your own expert barista in the comfort of your home with the new Gold Label Nespresso-compatible capsules. Create various recipes to enjoy the naturally flavored coffee beans that have been carefully selected and roasted to perfection, then packaged into convenient capsules, ready at any time of the day. Imagine the subtle scents that tease your senses and the velvety texture of every sip. Be proud of your own creation from an espresso machine, just like one made by a barista who grinds fresh beans, and makes sure that the brew process is perfect, so you get the best cup of coffee possible from the best beans available. Net Contents: Gold Label - Nespresso Compatible capsules. Pack of 12. Preparation and Usage: Gold Label Espresso is perfect on its own. 100% compatible with Nespresso® System. Just a few years ago, coffee brewing technology reached new heights when the single-serve espresso machine (Nespresso machine by Nestle) was created. This single-serve capsule machine provides the luxurious convenience of creating single-serve lattes and cappuccinos that are as delicious as those sold by coffee shop baristas. The machines used to be sold exclusively to club members in Europe, but are now more available all over the world for consumers who want them in their homes and offices. The home espresso machine has become increasingly popular over the last two decades because of the 'pump' feature that provides power to quickly push hot water through the finely ground espresso. The best advantage of having these highly innovative coffee machines is that you can get your own fresh cup of coffee anytime from sealed capsules that retain the fresh flavor and aroma of your favorite coffee beans. Now, the perfect cup of home-brewed coffee can be yours. When in the past, the “intelligent extraction” technology was protected by patents and owners of single-serve espresso machines were forced to buy their coffee from Nespresso, now you can enjoy more exotic flavors from coffee beans coming from the mountains of Indonesia. We have packaged our Kopi Luwak beans into Nespresso-compatible capsules so you can enjoy the luxury of drinking your favorite coffee at your convenience. Each single-serve capsule contains 100% authentic wild roasted Arabica Kopi Luwak beans either from the Gayo plantations in Northern Sumatra (Black Label) or the Bengkulu plantations in Southwest Sumatra (Gold Label). These beans are picked through a process of natural selection by freely roaming wild Asian Palm Civets, who have the eye for only the best and the juiciest coffee berries. While traditional brewing methods using conventional filter system offer most consumers an aromatic and delicately-flavored cup of coffee, brewing very finely ground coffee beans through an espresso machine uses very hot water that is pushed through the grounds with great pressure. Espresso from coffee pods gets its distinct aroma and unique flavor through this special brewing process. Our new Kopi Luwak Nespresso-compatible capsules offer the exclusive luxury of an exceptional brew every time, with two rich and flavorful varieties to choose from – a perfect drink anytime. Our Nespresso- compatible capsule alternative has been designed for use in the Nespresso® machines. We are constantly working to ensure that these capsules are developed to the highest standards available, ensuring effective function in compatible machines. Our aim is to offer every coffee lover a great option to enjoy their gourmet beverages, as one might expect from the high-tech espresso machine at their local coffee house. We are confident that you will enjoy your daily experience with our new Kopi Luwak Nespresso-compatible capsules. Our Kopi Luwak capsules come in two varieties – Gold Label and Black Label Kopi Luwak ground beans. These coffee pods are 100% compatible with a wide range of Nespresso® Systems including these - Inissia, U, Pixie, Citiz, Maestria, Lattissima, Essenza, and Le Cube. Our exclusive coffee products are packaged in resealable air tight bags which contain 12 capsules.